Portsmouth Raceway Park hosted Vallery Chevrolet Kids Night this past Saturday. Jason Montgomery, Todd Robinson, Matt Melvin, and Zack Pendleton all recorded wins in their respective divisions. They weren’t the only winners though. With the grandstands full of young people, 13 children were lucky enough to win brand new bicycles. While Kids Night provided plenty of entertainment for youngsters, Jason Montgomery showed that he was the man in the Late Model Class. The Jackson driver set fast time, led every lap of his heat, and went on to lead all 25 laps of the feature. Montgomery became the first driver not named Conley to record a Late Model win in Portsmouth this season. PRP has now witnessed four different winners in four different races in the Giovanni’s Pizza Late Model Division. While Montgomery was the class of the field, his win didn’t come all that easy. Chillicothe’s Mark Frazier was strong all night. He challenged Montgomery hard early on in the race and stayed within striking distance throughout the duration of the event. With Montgomery and Frazier taking the top two spots, third place went to Wheelersburg’s Kevin Wagner who has now finished in the top five every race this season. Vanceburg, KY’s Robbie Lewis was fourth, and Barboursville, WV’s Jake Keaton rounded out the top five. The rest of the top 10 consisted of Kyle Berck, Audie Swartz, J.T. Conley, Butch Dowdy, and Avery Taylor. Berck traveled the furthest distance of any racer, as he is a native of Nebraska. Taylor was the youngest driver in the Late Model field. Saturday marked his 16th birthday, which he celebrated with a top 10 finish. Delmas Conley appeared to be poised for another top-five finish, but his engine went up in flames with just seven laps remaining. He was riding fourth at the time. In the R.W. Rental and Supplies Modified A-Main, Todd Robinson won for the third week in a row. The South Point driver led every lap using the high groove with his car near the wall throughout the entire feature leaving virtually no room for error. Shawn Holliday was second. Brian Skaggs placed third. Jeremy Hayes finished fourth. Jody Puckett climbed from 12th to fifth and was named the Markwest Ranger Pipeline Hard Charger for advancing the most positions in the race. Doug Adkins, Shawn Valenti, Tim Lambert, Justin McNutt, and Eric Berry rounded out the top 10. 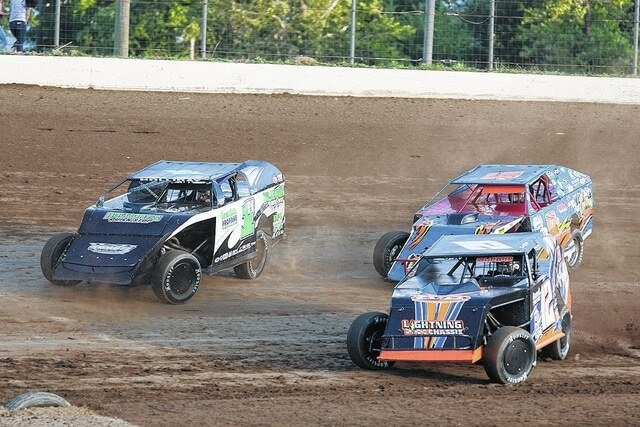 Perhaps the biggest twist in Modified Feature occurred before it ever actually began. Pole-sitter Jeremy Rayburn came out onto the track from the staging area and his car stalled. It never would re-fire and he had to be pushed back into the pits prematurely ending his night. As it turned out, one of his battery cables simply came loose. Matt Melvin returned to victory lane in the O’Reilly Auto Parts Limited Lates. Melvin won back on opening night, and returned to that type of form on Saturday. He led every lap and fended off his father, John. Finishing behind the Melvins were Evyian Terry, Joe Whitt, and Mike Meyers. The next five were Billy Staker, Ronnie Whitt, Braden Roof, Randy Ross, and Harold Terry. The M & M Inflatables Bomber Division was again dominated by Zack Pendleton. The 20-year-old from Stout led every lap of his Week’s Wrecker Service Heat as well as every lap of the feature. He’s now won three in a row. Placing behind the defending track champ were Wayne Hughes, Jason Spillman, Rick Butler, Perry Dearing, Corey Lewis, Mike Drake, Jonathan Cook, Kasey Black, and D.J. Morman. PRP will be back in action this coming Saturday racing the annual Limited Late Model Extravaganza. Along with the Limited Lates will be Late Models, Modifieds, and Bombers. Gates open at 4 p.m. with racing at 7:30.